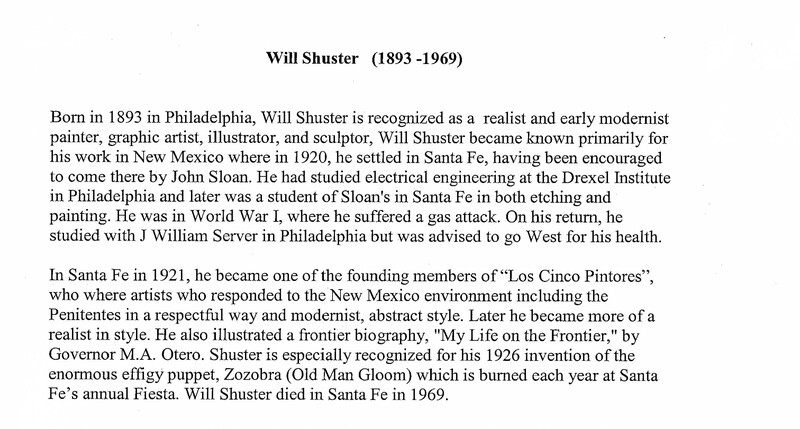 William Shuster is recognized as a realist and early Modernist painter, graphic artist, illustrator, and sculptor, Will Shuster became known primarily for his work in New Mexico where in 1920, he settled in Santa Fe, having been encouraged to come there by John Sloan. He later became a student of Sloan's in Santa Fe in both etching and painting. In Santa Fe in 1921, he became one of the founding members of “Los Cinco Pintores”, who where artists who responded to the New Mexico environment including the Penitentes in a respectful way and Modernist, abstract style.